All 15 county recorders agreed to a settlement Friday afternoon under which each would give voters an opportunity to “cure” early ballots before those ballots are rejected for signature problems on the envelopes. When county election officials believe the signature on an early ballot envelope doesn’t the signature on file for that voter, they contact the voter to settle the matter. But most don’t extend that practice to early ballots that voters drop off at polling places on Election Day. Several county Republican Party organizations sued the recorders on Wednesday over the disparate policies, arguing that all counties should use the same policy. The parties to the lawsuit walked into Maricopa County Superior Court for a hearing on Friday and informed Judge Margaret Mahoney that they’d reached a deal. Voters in all 15 counties will now have until Nov. 14 to rehabilitate early ballots with signature problems.The State of Arizona and the Arizona Democratic and Republican parties agreed to the settlement, as well. “We settled right when we walked in this room,” said attorney Brett Johnson, who represents the Apache, Maricopa, Navajo and Yuma Republican parties. Only Coconino, Maricopa, Pima and Pinal counties had implemented a policy of reaching out to voters about early ballots that had been dropped off on Election Day. Pima County has used that policy for about 15 years, while Maricopa County adopted it the week before the election after a coalition of civil and voting rights groups threatened possible legal action. State Election Director Eric Spencer said after the hearing that he expects the new policy to affect between 5,000 and 10,000 ballots across the state. The majority are likely in Maricopa County, which had already adopted the policy. The settlement only applies to the 2018 election, and doesn’t settle the claims by the county GOP groups that the disparate policies violate the Equal Protection clause of the Fourteenth Amendment. Johnson and Langhofer said they expect the problem to be resolved through legislation or the next version of the secretary of state’s election procedures manual, which provides binding election guidelines to the counties. Under the settlement, it will be up to each county to determine how to reach out to voters who have issues with their early ballots. But Spencer noted that the counties agreed to provide information on those ballots to the Democratic and Republican parties, and he said he expects them to do most of the work because they have an incentive to rehabilitate early ballots. 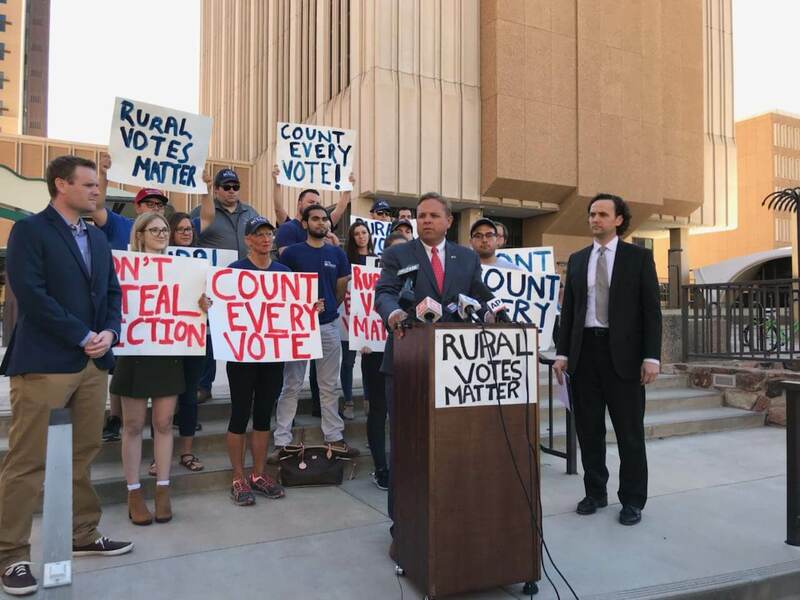 “I think that’s where 95 percent of the effort is going to be is the political parties stopping by the voter’s house and even offering to give them a ride to the county recorder to get this fixed,” Spencer told reporters after the hearing.